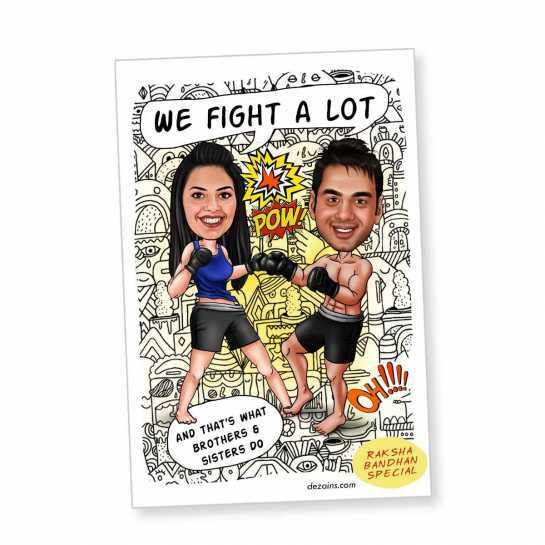 This caricature magnet explicitly reflects your fighting relation with your brother and will remind you throughout the day that who is the ideal winner. The caricature hand drawn paintings of you and your brother are done in an excellent way by expert artists. Can I see the preview of the caricature artwork? Yes, you will receive the soft copy of the caricature for approval before it goes for production. You will get an SMS/E-mail asking you to check the soft copy. You can check it from order tracking section. Can I ask for any changes in the caricature artwork that I receive? Yes, you can suggest the changes needed in the caricature. We will make those changes and send you the revised copy of the artwork. i. The chnages can be done only in the face part of the artwork - the theme/body/background/pose etc cannot be changed. ii. The corrections to be suggested have to be made on the basis of the photo that you provide while ordering the photo. Corrections cannot be made based on new photos provided. iii. As it is a caricature and not a portrait - the artwork will resemble the photos provided upto 80-85%. iv. The correction may take 1-3 days. So, the delivery time may exceed accordingly. What is the cancellation policy if I do not like the artwork sent to me? You can suggest the changes if you do not like the soft copy of the artwork that you have received (based on above points) and we will send you a revised copy. In case you want to cancel the order at this stage, deduction of Rs.400/- per caricature will be made to partially cover the cost of the time and efforts put in by the artist. The rest of the amount will be credited to you in 8-10 working days. Material Acrylic (3-4 mm) with 4 small magnets on back side. The artwork is printed on premium vinyl and pasted on acrylic.